While the majority of you reading this will laugh at the thought of your spouse being your idol, there are others of you who are feeling a nudging at your heart and there’s no doubt that you’ve placed your spouse in a position that’s not reserved for him. While you’re pondering your own relationship, I want to share my very own story of idolatry with you. It’s one that I’m not proud of, but needs to be shared so you don’t feel as though I’m pointing fingers at you! I remember quite vividly where I was when the Lord showed me that my at-the-time husband had become an idol in my life. We were counselors on a retreat with the students that we served at our church. We had only been married a couple years, but he had become the most important thing in my life – my everything. I had placed him on a pedestal and, unbeknownst to me, this was an unhealthy place for any spouse. Although I’ll never understand why the Lord chose that trip to open my eyes to the situation that was going on in my own heart and life, I have no doubt that His timing is perfect! It was on that trip that I promised the Lord that, along with His help, I was going to do everything in my power to make Him number one in my life. Now, I’m not saying that your marriage is going to fall apart if you decide to remove your spouse from the pedestal you’ve placed him on. What I am saying is that making this decision will allow you to have a much healthier relationship, not only with him but with the Lord as well! The Lord should be your first priority! I know, it’s kind of a no-brainer, but I still have to mention it. I can’t help but share the illustration that a lot of pastors use in premarital counseling. 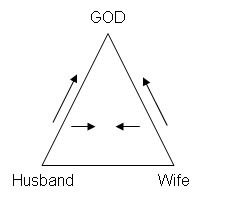 Picture you and your spouse as the two points at the bottom of the triangle and the Lord as the top point of the triangle. 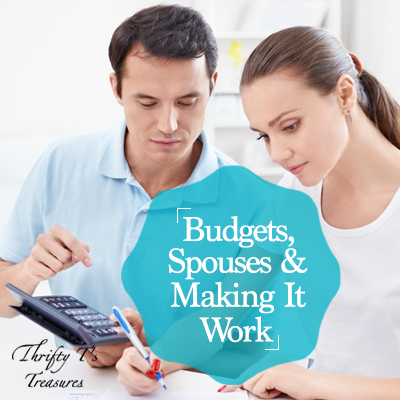 When you make yourself (or, in this case, your spouse) the first priority you grow upwards. But when you turn your focus to the Lord and make Him the first priority you not only begin to grow in your relationship with the Lord, but you toward your spouse as well. And oh what a healthy marriage this creates! When your spouse is your idol it not only hurts you, it also hurts them. 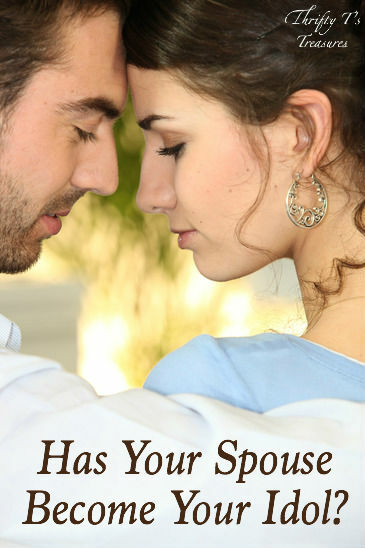 You’re setting your spouse up for failure. We’ve all seen the movies with the girl that has the perfect husband who does no wrong. He reads her mind, knows everything she needs, fulfills her deepest desires and they live happily ever after. There’s no doubt about it – that is definitely the perfect marriage. But I hate to break it to you, my friend, that marriage just doesn’t exist! I’ve learned the hard way that I need to let the Lord fulfill the deep desires and needs in my heart and life. Armed with the lessons the Lord taught me from my previous marriage, I’m doing my best to apply them in my current marriage (yes, the Lord has blessed me with a wonderful husband). 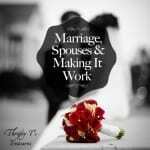 I have done the best to set my husband up for success and create a healthy relationship. Now that you’ve had a little bit of time to reflect, it’s time to be honest with yourself and the Lord. Has your spouse become your idol? If so, won’t you tell the Lord what’s going on? After all He already knows and is patiently waiting to hear from you! This topic is one that needs to be talked about. I did not realize how much my husband was my idol until he went to heaven. It wasn’t until I was in a widows grief group and heard the facilitator say that widows tend to put their deceased husbands up on a pedestal that I realized that I had put my husband on a pedestal long before he died. It was a real awakening for me.